Ligonier Ministries (with R.C. Sproul) is offering free Kindle and ePub downloads of the September issue of Tabletalk. If you’ve never tried Tabletalk, this would be a great time to check it out. Each month’s issue contains thoughtful and challenging articles relating to the Christian faith as well as daily devotional readings. This month’s issue focuses on the tenth anniversary of 9/11 and the church’s response. In addition to the daily Bible studies and feature columns, this issue contains articles such as “The Gospel for Muslims” by Thabiti Anyabwile, “A Pastor’s Reflection” by Rev. Charles Drew, “Can God Bless America?” by Dr. John MacArthur, “Ten Years Later” by Dr. R.C. Sproul, and more. Amazon announced today that the latest software update to the Kindle will include real page numbers. This has been a huge issue for the Kindle, so I am glad to see Amazon finally addressing it. Kindle’s page numbers match the page numbers in print books so you can easily reference and cite passages, and read alongside others in a book club or class. 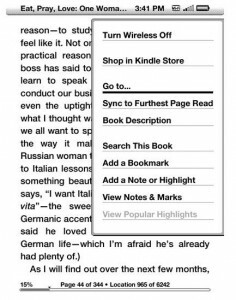 If your Kindle book includes page numbers, you’ll see page numbers displayed next to locations when you push the Menu button. Page numbers and locations are only displayed when the Menu button is pushed. I format ebooks for authors and publishers, and this is similar to a solution that I offer my clients. I call it the page number grid. The page number grid correlates with the print version of the book and provides a convenient way for ebook users to jump to any page from the print edition. This is especially helpful for group situations or Bible studies where some people have the print edition and others have the ebook. You can find an example in an ebook that I recently formatted for Dr. William B. Salt. Here is the link to Amazon, and you can just download the free sample to check it out: Still Hurting, Find Health. Note: For ebook and audiobook conversions, see Fowler Digital Services. Click here for the latest Amazon Black Friday deals all day long. And if you click over to Amazon at the right time, you can even pick up a Kindle 2 for $89. That’s right – $89! This is for a Kindle 2 with built in 3G access for life and no monthly contracts. (I bought this same model back in January for $289.) If you have been thinking of getting a Kindle for yourself or someone else, this is the absolute lowest price Amazon has ever offered. When do you click? Some reports say the deal starts at 9:00 a.m. PST (12 noon EST) while others say 9:00 a.m. EST. The officical Amazon page currently says 9:00 p.m. PST (12 midnight EST), but the p.m. might be a typo for a.m. Supplies are limited on this offer so you may want to check over there several times throughout the day. • Click here to go directly to the Kindle 2 page. • Click here to read about the Top Ten Kindle Features. • Click here for the latest Amazon Black Friday deals all day long. I don’t know why, but if you go to Google and type in the search terms “kindle features and benefits,” my article on the Top Ten Kindle Features comes up first out of 11,000,000 results. For some reason it ranks even higher than Amazon itself. Not that I’m complaining, but it sure is weird. If you or someone you know is working on an ebook or interested in self-publishing, I encourage you to check out Fowler Digital Services. I produce quality ePub and mobi/Kindle conversions which are readable on all standard e-readers including Apple iPad/iPhone, Amazon Kindle, and Barnes & Noble Nook. I am careful to preserve the original format of the print book, as well as provide extra features such as an active table of contents, fully-linked footnotes, and even a page number grid (with links to pages from the print edition of the book). ePub and Kindle/Mobipocket copies included with each order. If I can be of service to you, please do not hesitate to contact me. Click here to learn more about Fowler Digital Services. New Amazon Kindle Goes Wi-Fi! The new 3G model is available in your choice of color — either graphite or white. And the new Kindle cover even includes a built-in, retractable LED reading light. 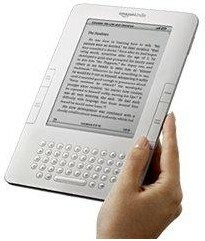 If you are looking at getting into e-books, I believe these are the best e-readers at the best price available today. 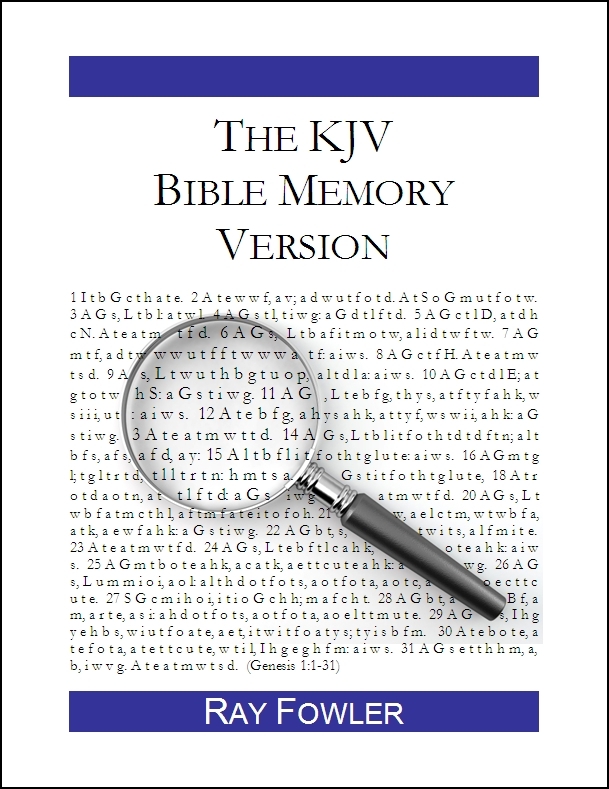 Check out The Bible Memory Version for the Kindle here. In yesterday’s most popular Bible passages there was a clear theme of trusting God and not worrying. The main theme I could find here has to do with the relationship of Muslims with Christians and Jews. 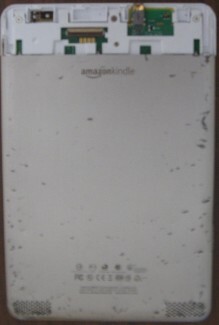 • New Amazon Kindle Goes Wi-Fi! As much as I still love good old-fashioned print books, there are new benefits that come with ebooks and ebook readers like the Amazon Kindle. Here are the top ten things I like about the Kindle, including my absolute favorite (and little known) Kindle feature listed below. Portability: The Kindle is lightweight, and easy to carry around. And it almost feels like a regular book when you put it in its book cover. 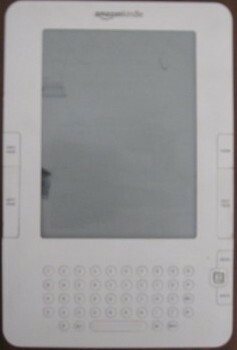 Readability: The E-Ink screen is amazing. It is just like reading paper. I can adjust the font size up or down as needed. I also like that I can hold the Kindle “open” and “turn the pages” with just one hand (leaving the other hand free for coffee or tea). Accessibility: I have access to all my Kindle books and magazine subscriptions at all times. Plus, I can browse new books, read samples, and download directly to my device. As a result, I find I am reading more with my Kindle, which is a good thing. Flexibility: I am not limited to the Kindle reader but can read my Kindle books on a variety of devices , including my desktop computer, laptop, or netbook. 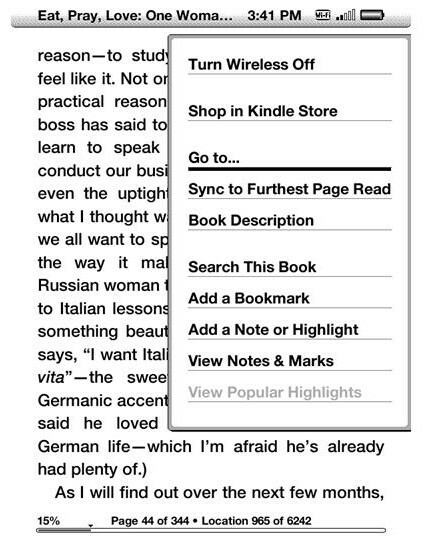 When I switch devices, each book opens up exactly where I left off reading on the former device. Multiple devices also means more than one family member can be reading Kindle books at the same time. Amazon offers reader apps for PC, Mac, iPhone/iPod Touch, BlackBerry, Android, and now Tablet Computers (including the iPad). .
Searchability: I can search for specific words or phrases in individual books or across my whole library. Free samples: Who doesn’t like free samples? I can download free samples from books or magazine subscriptions and preview before purchasing. Cost savings: This one is simple. Books are cheaper on the Kindle. Most books I have purchased are $9.99 or less. Many of them you can get for free (including over 30,000 classic titles from Project Gutenberg). Space savings: We ran out of bookshelf space a long time ago. Many of our books are currently in boxes. With the Kindle I can purchase new books without worrying about where to put them. Note-taking: It is easy to highlight text and make notes on the Kindle while I read, and I never need to look around for a highlighter or pen. Note-retrieval: I used to type up important notes and quotes from a book when I finished reading it, but it was a long, laborious, time-consuming process. Amazon saves all my highlights and notes along with their locations for me at a special password protected website. When I finish a book, I can go to the website and easily access all my underlines and notes for that book in order. Then I copy and paste them into a Word file for permanent reference. This is a huge time saver, and one of the best advantages of digital over printed books for me. Note: This is different from (and far superior to) the Kindle’s clunky My Clippings folder.